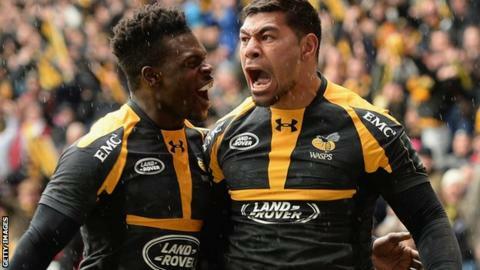 Jimmy Gopperth kept his nerve to kick Wasps into a European Champions Cup semi-final against Saracens after an extraordinary win against Exeter. The visitors led 14-6 at half-time after two tries from Thomas Waldrom wiped out Gopperth's two kicks. Wasps' Charles Piutau and Chiefs prop Harry Williams traded tries and Gareth Steenson kicked Exeter 24-11 ahead. Frank Halai gave Wasps hope, but Exeter looked set to hang on until Gopperth converted Piutau's last-second try. Wasps, who won the Heineken Cup in 2004 and 2007, will play Saracens in the last four at Reading's Madejski Stadium on 23 April after the English champions fought back from a half-time deficit to beat Northampton 29-20 in the second semi-final on Saturday night. Match-winner Gopperth was mobbed by his team-mates as the ball sailed over the posts from the right touchline, sparking wild celebrations among the Wasps fans at the Ricoh Arena. Exeter players slumped to the turf in disappointment as the Premiership club, only promoted to the English top flight six years ago, missed out on their first European semi-final. The Chiefs had defended admirably throughout the quarter-final, particularly in the opening half hour when they limited their dominant hosts to just two Gopperth penalties. And tries from Waldrom and Williams, plus the reliable boot of Steenson, left a quietened home crowd fearing the worst. But Exeter's efforts finally told as Wasps produced a memorable fightback in the final 15 minutes. With Exeter threatening, the home side played out from behind their posts as Elliot Daly and Christian Wade turned last-ditch defending into an attack full of sharp running and trickery, Halai eventually finishing off a few phases later and Gopperth converting for 24-18. Wasps relentlessly pounded the tiring away defence in search of a dramatic finale - and it finally arrived. The game had ticked past 80 minutes when Piutau raced on to a flat pass to dart through the Exeter line, and Gopperth applied the coup de grace. Gopperth, 32, told BBC Radio 5 live sports extra: "As a goalkicker they are the moments you practice night and day. "I had to treat it as my first kick of the match. I was relaxed and as soon as it hit the foot I've never celebrated so much. As soon as I struck it, I knew it was good. "The win was a great team effort from that position and we showed a lot of character. I was happy to finish it off for the boys." "That was knockout rugby at its very best - the last kick in the last minute of this amazing quarter-final. "We've seen brilliant rugby from both sides - there didn't deserve to be a loser. "Wasps were expected to win with home advantage and their quality, but Exeter pushed them right to the end. At one stage Exeter would have felt they had this game. "Exeter should have taken the opportunity to drop a goal that would have put them 14 points ahead. "Wasps wouldn't have come back from that. Instead they sniffed an opportunity and took it with both hands." Wasps: Charles Piutau; Christian Wade, Elliot Daly, Siale Piutau, Frank Halai; Jimmy Gopperth, Dan Robson; Matt Mullan, Carlo Festuccia, Jake Cooper-Woolley; Joe Launchbury, Kearnan Myall; James Haskell (capt), George Smith, Nathan Hughes. Exeter: Lachie Turner; Jack Nowell, Henry Slade, Ian Whitten, Olly Woodburn; Gareth Steenson (capt), Will Chudley; Ben Moon, Luke Cowan-Dickie, Moray Low; Mitch Lees, Geoff Parling; Don Armand, Julian Salvi, Thomas Waldrom. Replacements: Jack Yeandle, Alec Hepburn, Harry Williams, Damian Welch, Dave Ewers, Dave Lewis, Michele Campagnaro, James Short.